We’re on a quest to visit all 50 states! Of course, our quest to visit all 59 national parks trumps this quest, but those national parks will get us to Arkansas, New Mexico, North Carolina, South Carolina, and Texas someday! We can never decide if driving through a state should count as having visited that state. Hence the asterisks in our list! 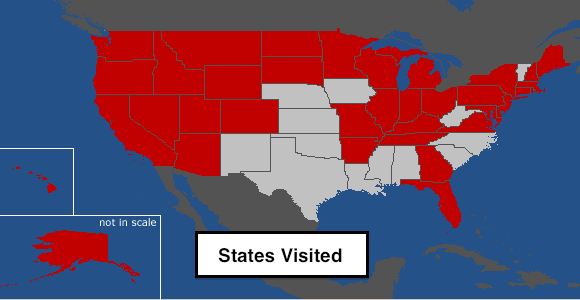 How many US states have you visited? Which ones are next on your “to see” list and why? Enjoy your week or your weekend, wherever you are! I’m loving your site! I recently started a travel blog with the goal of visiting all 50 states. I’m getting some good ideas from your blog…thanks! I think it would be impossible for us to drive through a state and NOT do something touristy. There’s always something! Thanks for stopping by our blog. We’ll check yours out, too!